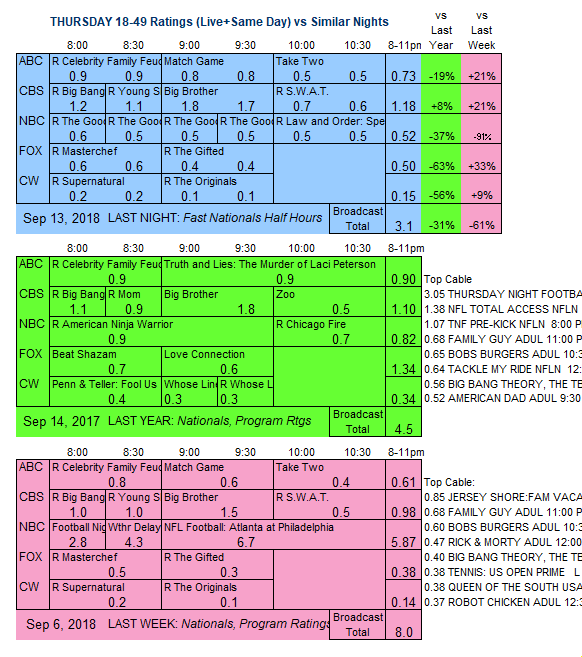 NOTE: CBS and NBC time-period ratings below are inflated about a tenth of a point by local broadcast pre-emptions for THURSDAY NIGHT FOOTBALL (aired nationally on the NFL Network). WKRC in Cincinnati carried the game instead of the CBS schedule, and WBAL in Baltimore carried the game instead of the NBC schedule. Also, the ratings below for all networks are distorted by local news pre-emptions in North and South Carolina for Hurricane Florence coverage. ABC: The season finale of MATCH GAME is currently up 0.2 to 0.8, and the season finale of TAKE TWO is up 0.1 to 0.5. The night started with a CELEBRITY FAMILY FEUD rerun at 0.9. CBS: BIG BROTHER is currently up 0.2 to 1.7. The reruns are at 1.2/1.1 for the sitcoms, and 0.6 for SWAT. 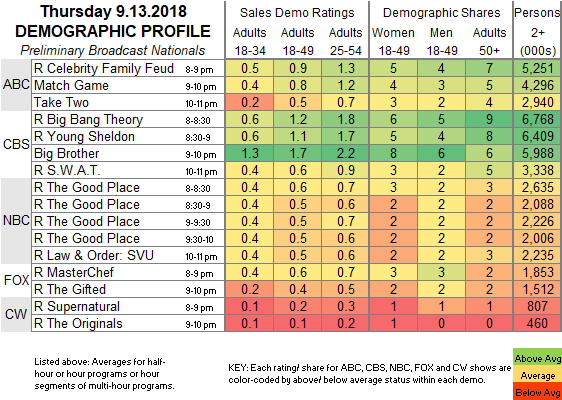 NBC: Reruns at 0.5-0.6 for now. CBS airs a SUNDAY’S BEST special tonight, saluting its own CBS SUNDAY MORNING series.